It’s time to announce the winners of the Business Card Giveaway! The cards are furnished by PrintRunner. We had three total entrants, with a total of 6 entry points. Because you can only win once, and because PrintRunner was nice enough to give me three codes for the free business cards, everybody was a winner! So, Jake, Jason, and Hannah, you win! I’ll email you your code and you can start printing your business cards! 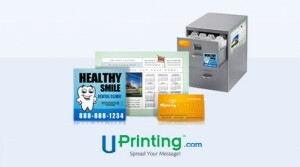 There’s always some talk about getting custom business cards made up for your blog business so I thought I would pass along this coupon code for printingforless.com. The coupon code is good for a buy 250 Letterhead & Envelopes, get 250 FREE Letterhead & Envelopes plus 500 FREE Business cards. The first 250 letterhead and envelopes will set you back about $343, but when you consider that it gets you 500 Letterhead & envelopes as well as 500 business cards, it’s actually quite a deal. In fact, when you add it all up, it’s worth over $400 in free supplies. The coupon code you can use at check out is ASTAT250. Put your order in today!